Have you tried resting on an adjustable bed? This is a bed type that can be adjusted to various positions by using electrically-powered controls, for therapeutic purposes and for complete comfort. These types of beds are commonly associated with hospital stays since the adjustable bed frame is ideal for patients who have limited mobility. The adjustable features make it possible to place the patient in the best position as part of the recuperating process in hospitals and other healthcare institutions. Read our latest guide about the best organic mattresses. Nowadays, the benefits of using adjustable bed frames – with the right type of mattresses – are making their way to private homes as well. 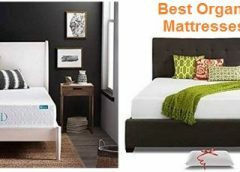 The best mattresses for adjustable beds will make sure that you get all the advantages of the technology, previously only enjoyed in hospitals. The right mattress and an adjustable bed will help you get that perfect position so you can have the most restful sleep, and you will pleasantly be surprised at the improvement this can have on your overall health and well-being. A flexible mattress used with an adjustable bed can be enjoyed for purposes other than recuperation and sleeping. Just imagine how comfortable it would be if you can use watch TV on the same bed, with only a few slight adjustments so you can have the perfect angle for the ultimate in comfort and viewing pleasure. In addition, you do not have to limit yourself to a perfectly straight body position when you sleep; you can keep your feet elevated or have your head at a slight incline. The adjustable bed frame and mattress can give you a customized sleep for the perfect slumber. The material of memory foam mattresses adapts to your body’s contours and weight, resulting in even pressure/weight distribution. This property also gives you that feeling of lying down on air with a weightless sensation. Pressure points are relieved with the help of a memory foam mattress, which has the flexibility to bounce back and conform to the contours of an adjustable bed frame’s moving parts. A memory foam mattress used with an adjustable bed provides superior comfort without sacrificing strong support. A 100% latex mattress for adjustable beds also helps in relieving pressure points for a more comfortable sleep. This type of mattress also offers the bounce (due to its rubber content) that can be felt with a conventional innerspring mattress and it goes back to its original shape faster than memory foam. They are slightly more rigid – yet more durable – compared to memory foam mattresses, so it is best to use a thinner latex mattress with an adjustable bed. You can have a cooler experience when using a latex mattress since it does not have the memory foam’s tendency for temperature spikes. These are considered the traditional mattresses, which feature a padded top layer encasing coiled springs that give the mattress that bounce. The coiled springs inside the mattress offer superior comfort initially; however, in time these springs create pressure points that cause discomfort. An innerspring mattress is not usually considered for use with adjustable beds, but some brands are now offering more flexible products that can be used for an adjustable bed frame. Air mattresses adjustable beds have several air chambers, as the ones with only a single chamber are too rigid for use with an adjustable base. The support can be customized by increasing or decreasing the air pressure; however, air mattresses, in general, do not have the flexibility of latex or memory foam mattresses. The angles you can adjust to are also limited when you use an air mattress for an adjustable bed. A hybrid mattress is made by combining two materials, such as innerspring coils with memory foam, or a blend of spring coils and latex. When you choose a hybrid mattress to use with an adjustable bed, you get the best of both worlds – the bounce from the coils plus the soft contouring properties of memory foam or latex. Hybrid mattresses for adjustable beds tend to be more expensive compared to other mattress types, but they also offer high durability. An organic mattress is made from sustainable materials and created without using harmful chemicals. The materials used are also naturally flame-retardant, ensuring that you will not be exposed to harmful flame barrier chemicals. Organic mattresses for adjustable beds are usually made with latex, giving them the flexibility needed to be able to bend and move accordingly with changing positions of the bed frame. Organic mattresses used with an adjustable bed are naturally resistant to mildew and mold, making them the ideal choice for those with allergies. Without the harmful chemicals, you can be assured that your mattress will not have a toxic smell aside from the faint rubber smell that comes with the latex composition. When looking for mattresses for adjustable beds, one of the first things to consider is the mattress’ flexibility – it should be flexible and bendable enough to follow the movements of the bed frame. The best mattresses for adjustable beds should have a thickness ranging from 8 to 12 inches. A thicker mattress may not easily bend and move with the adjustable bed, while a thin mattress may not give adequate support and comfort. These mattresses should also be durable enough to endure more than the usual wear and tear of regular mattresses, as they will be subjected to numerous movements with the adjustable bed base. Check if the warranty covers the extra movements associated with an adjustable bed frame. Conventional mattresses and bed frames may not give you the level of sleeping comfort you need. Your body may be looking for a position rather than being forced to lay on a straight, flat mattress. On a nightly basis, you can adjust your sleeping position with the help of a mattress used with an adjustable bed frame, so you can finally get the comfort you need as you recuperate through deep, re-energizing slumber. Mattresses specifically suited for adjustable beds have therapeutic benefits that come with being able to adjust sleeping positions. The customization can spell the difference between restful sleep and a few hours of pain & discomfort (and sleeplessness). Getting into your most comfortable position through as you sleep can improve blood circulation, as well as health issues such as heartburn, snoring, sleep apnea, breathing issues, and other conditions. When you have the right mattress with an adjustable bed, you will not have to go through the inconvenience of switching places for different activities. You can sit up while doing some light reading on the bed, and then do a minor adjustment so you can recline a bit if you want to watch TV for a while. Using the electrically-powered remote control, you can again adjust the mattress and the bed frame’s angle so you can get into your most comfortable sleeping position. The adjustable bed and mattress also make it easier for those who have limited mobility to get the help they need from their caregivers. With just a few adjustments by using the remote control-powered options, it would be a lot easier for the aid giver to take care of the patient’s needs, without the need to go through awkward positions that can also be uncomfortable for the patient. 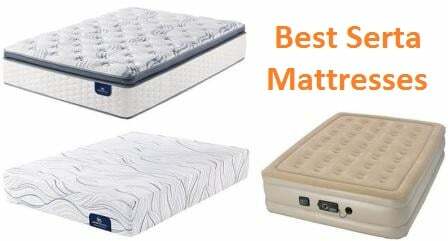 This mattress features a 3-zone pocketed innerspring coil base with built-in lumbar support. On top of the innerspring base lies 3 inches of 100% natural GOLS-certified Dunlop latex, which is in turn covered by a GOTS-certified organic cotton quilted cover protected by eco-wool sourced from California and Oregon. The built-in lumbar support in the innerspring coil base provides superb support for your back to avoid discomfort while sleeping. The latex layer provides additional support and softness that contributes to a restful night’s sleep. It also helps keep the mattress cool, so you do not wake up in the middle of the night feeling overheated. The button-tufted design offers increased durability while keeping the layers together without the need for chemical adhesives. The fabric-encased innerspring coils are designed to move independently, reducing motion transfer so your partner will not be disturbed with your movements. The My Green Mattress Natural Escape Medium Firm Mattress (Queen) is 11.5 inches thick, making it ideal for an adjustable bed frame. This is a medium firm mattress that is ideal for those who sleep on their stomach, side, or back. Also ideal for heavy sleepers. The built-in lumbar support ensures that your back is supported even as you sleep. Improved edge support provides a firmer seating edge, so you don’t feel like you are going to slide off the mattress when you move close to the edge. The Dunlop latex material of the top layer offers superior flexibility, making this product ideal for use on adjustable beds. The combination of Dunlop latex and independently-encased coiled springs work to minimize pressures points on the body, ensuring that you say comfortable while on this mattress. The My Green Mattress Natural Escape Medium Firm Mattress (Queen) is Greenguard Gold-certified. It uses GOLS-certified organic, 100% all-natural Dunlop latex. The organic quilted cover is GOTS-certified, while the natural wool underneath is OEKO-Tex-certified. The natural wool cover helps this product to pass the required flame tests by acting as a natural flame barrier, eliminating the need for harsh chemical flame retardants. This mattress comes with a 25-year warranty and a 100-night sleep trial. This mattress is protected by a soft and breathable cover that provides enhanced comfort. The 2.5-inch memory foam layer is infused with bamboo charcoal that neutralizes temperature and odor. 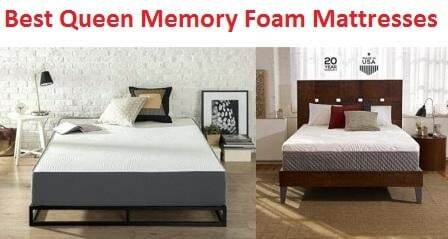 This layer of memory foam is also infused with aloe for additional freshness. In between the memory foam and the steel coil layer, lies a 2-inch support foam that evenly distributes weight on the mattress. 5.5-inch individually-encased steel coils offer strong support and relieve pressure points for overall comfort. 5-inch edge support ensures that the entire mattress can be enjoyed and maximized, regardless of the sleeping position. The LUCID 10 Inch Memory Foam Hybrid Mattress’ memory foam layers are infused with Aloe Vera and bamboo charcoal to reduce unpleasant odors. These infusions also contribute to a more relaxing sleep by regulating temperature. The individually-encased steel coils quickly respond to movement, reducing motion transfer to ensure that your movements will not disrupt your partner’s slumber. These coils also help relieve pressure points to give you the most comfortable sleep possible. This hybrid mattress combines the support offered by the individually-encased steel coils, with the comfort of the memory foam and transition foam layers. This is a 10-inch thick mattress, ideal for use on an adjustable bed base. The medium-plush feel of this mattress makes it ideal for all sleeping positions and enhances overall comfort. Enhanced edge support is offered by this mattress, allowing you to enjoy every part of the mattress without worrying about falling off the edge. The memory foam layer provides the flexibility that makes this mattress ideal to use with an adjustable bed frame. This mattress is CertiPUR US-certified. This mattress has a 10-year warranty against manufacturer defects. The LUCID 10 Inch Memory Foam Hybrid Mattress has a 750-pound weight capacity. A 100% polyester cover keeps the mattress’ inner layers protected. The 1.5-inch layer of breathable, open-cell foam provides additional bounce and regulates temperature. A 1.5-inch layer of memory foam provides comfortable support, cushioning your body in a firm cocoon. It also reduces pressure points for a more comfortable sleeping experience. Providing support is the 5-inch poly foam, which acts as the strong base. 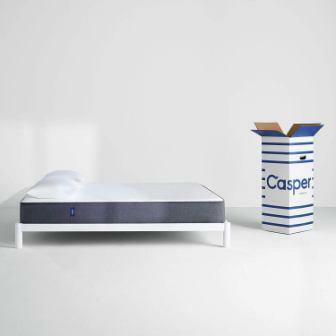 The Casper Sleep Memory Foam 10 Inch Mattress is created to provide a cool sleeping environment. This is made possible with the open-cell top layer that uses conduction and convection to disperse heat away from your body. The memory foam layer also works in keeping you cool throughout the night, by pulling the heat away from the top layer that comes in closest contact to your body. The four layers of foam guarantee that you will get the perfect balance of strong support and comfortable softness. This Casper memory foam mattress is 10 inches thick, making it ideal for use with an adjustable bed frame. The mid-level firmness of this mattress makes it ideal for all sleeping positions. This mattress keeps your body in proper alignment as you sleep, ensuring that you will wake up refreshed without aches and pains. This memory foam mattress has enough flexibility to be used efficiently with an adjustable bed base. The foam used in the creation of this mattress is CertiPUR US-certified. The Casper Sleep Memory Foam 10 Inch Mattress comes with a 10-year warranty, and a risk-free 100-night trial. A Tencel cooling cover protects the mattress and keeps heat away from your body. The quilted gel memory foam layer follows the natural contours of your body for added comfort. The next layer of gel memory foam helps relieve pressure points. Under the gel memory foam lies the adaptive high core memory foam layer that provides ample support. The breathing base layer works to stabilize the mattress. The Tencel cover works to move the heat away from your body so you stay cool and comfortable even after a few hours of sleep. This cover also makes the mattress resistant to dust mites, so that is one less thing to worry about. This mattress keeps your body cool with the help of the quilted gel memory foam and gel memory foam layers that work together to keep heat dispersed away from your body. This means you can look forward to restful sleep uninterrupted by an overheating sensation. A high core memory foam layer provides you with that welcome bounce that makes you feel like you are lying on a bed made of clouds. This 11-inch Nectar Calking Mattress Gel Memory Foam product is ideal for use with an adjustable bed frame. This is considered a medium firmness mattress, making it ideal for all sleeping positions. This is a flexible mattress that can be used for all bed types, including an adjustable base. The Nectar Memory Foam Mattress is CertiPUR-US-certified. It is crafted without using PBDEs, TDCPP, ozone depleters, lead, or mercury. 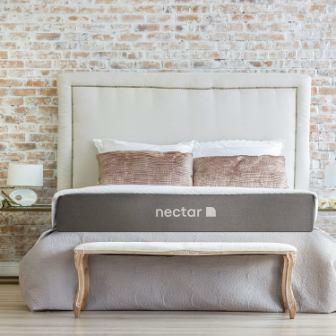 This Nectar mattress offers a forever warranty – with the company providing the guarantee for as long as you own the mattress. It also comes with a 365-night risk-free trial. The Sweetnight 10 Inch Gel Memory Foam Mattress is protected with a soft cover that keeps you feeling cool throughout the night. A 2-inch gel memory foam layer hugs the contours of your body for a comfortable feeling as soon as you lie down on the mattress. A 5-inch open-cell comfort foam layer stimulates air circulation within the mattress, bringing down the temperature so you do not experience hot spots. The 3-inch high-density foam provides ample support for the entire mattress. The gel memory foam layer works on keeping your body cool while cradling the contours of your body so you can get the most restful sleep possible – it will feel like you are sleeping on air or on clouds. The 5-inch comfort foam layer features a 3-zone design which includes a middle part that is firmer, to keep your spine perfectly aligned and to relieve pressure points. This layer also ensures that your body weight is distributed evenly so you can have a restful, comfortable night’s sleep. A 3-inch high-density support foam provides firm support for the entire mattress, and for your body. 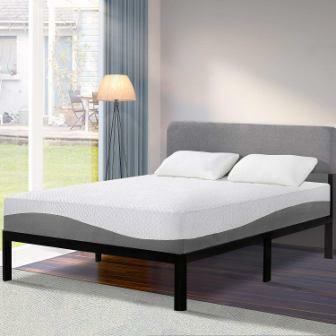 This 10-inch gel memory foam mattress is ideal for use with an adjustable bed base. The top side offers a plush sensation, while the bottom side has a medium-firmness – making this mattress an ideal choice for all sleeping positions. The high-density support foam layer works in reducing motion transfer, so you will not have to worry about your partner being disturbed by your movements during the night. The flexibility of this memory foam mattress makes it ideal for use with an adjustable bed frame. The Sweetnight 10 Inch Gel Memory Foam Mattress is CertiPUR-US-certified. This product comes with a 10-year limited warranty. This mattress is made with a 5-inch 100% high-density Visco Elastic Memory Foam, and a 7-inch high resilience polyurethane base foam layer. The Twin XL 21 Inch Deluxe Memory Foam Mattress for Adjustable Bed Base uses Visco Elastic memory foam technology which was developed by NASA. It works by sensing your body’s temperature and weight, so the mattress and its heat or warmth can adjust accordingly. The mattress relieves pressure points so you can be assured of feeling complete comfort even when you sleep for a few hours. The memory foam layer enhances comfort by conforming to your body’s contour, giving the sensation of being hugged in a comforting manner as you rest your tired body. This mattress is 12 inches thick – ideal for use with an adjustable bed frame. This medium-firm mattress is ideal for all sleeping positions and is made specifically for use with an adjustable bed base. The high resilience polyurethane base foam layer provides great support for the body, keeping the spine in proper alignment as you sleep for several hours in total comfort and relaxation. This mattress’ Visco Elastic Memory Foam offers superb pressure relief, which is comparable to conventional memory foam products. It also offers a cooler sensation (compared to latex and conventional memory foam) to you give you an uninterrupted, comfortable sleep. The Twin XL 21 Inch Deluxe Memory Foam Mattress is CertiPUR-US-certified. This product offers a 30-year limited warranty. The 9-inch Pure Green Natural Latex Mattress is protected with a 1-inch wool layer that is quilted into the mattress cover. Underneath the cover lies the soft 2-inch layer of 100% natural latex which adds comfort and softness. 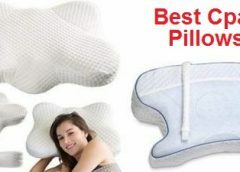 The base layer is made of 6 inches of 100% natural latex foam, which is firmer than the upper layer for strong support. The proprietary Pure Green latex was built after the company’s own design team from Chicago painstakingly tested several prototypes – before coming up with the perfect latex mattress construction. The mattress cover is created by joining two individual pieces with a high-quality zipper, which is positioned on the bottom edge of the product. This zipper can easily be opened whenever necessary for cleaning or maintenance purposes. The unique design of the cover makes it strong yet still stretchy, so you can feel the softness of the latex foam as it conforms to your body’s contours. The stretchy cover also enables the mattress to be flexible and bendable – making this mattress ideal for use with an adjustable bed base. This product is 9 inches thick – ideal for use with an adjustable bed frame. This mattress has medium firmness, which is ideal for side and back sleepers who want to have more support from their mattress. 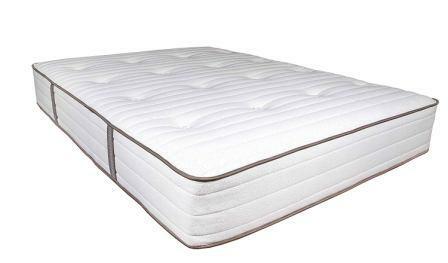 The latex foam base layers make this mattress flexible enough to be used without problems with an adjustable bed base. The natural latex foam also works in keeping the mattress cool, so you do not wake up in the middle of the night feeling overheated and uncomfortable. This mattress is Greenguard Gold-certified. It does not have chemical fire retardants or barrier cloths. This product uses GOTS-certified organic New Zealand wool, and GOTS-certified organic cotton. This product comes with a 10-year warranty. This mattress is topped by 2 inches of a cool gel memory foam layer for cool, comfortable sleeping. The middle layer is made of 2 airflow gel-supportive layers (1-inch thickness each), and the 6.5-inch base is crafted from high-density foam. The high-density foam base provides ample support for the top layers, making the mattress’ components work more efficiently. This mattress’ memory foam is infused with gel particles that work by dissipating the heat away from your body, so you can keep feeling cool and fresh even after lying in the same position for several hours. This layer also ensures that your spine is kept properly aligned throughout the night. The gel-infused memory foam has enhanced pressure point relief characteristics – even better compared to that of conventional memory foam. This translates to a restful night of sleep without tossing and turning as you search for a comfortable position. The knit top that covers the mattress is stretchy, making it easier for the gel memory foam to conform quickly and completely to the contours of your body. This mattress is 10.5 inches thick and ideal for use with an adjustable bed frame. This mattress has a medium-firm feel, ideal for all sleeping positions and for use with an adjustable bed base. As the gel memory foam is made of porous cells, it feels more comfortable compared to high-density elastic foam. The gel memory foam is naturally hypoallergenic and resistant to dust mites, mold, bacteria, and allergens. The Classic Brands Cool Gel 410107-1150 Mattress Queen White comes with a 10-year warranty. The cover of the Tuft & Needle Twin Mattress, Bed in a Box offers a plush, comfortable texture. The top T&N Adaptive Foam layer is infused with graphite and cooling gel to enhance a cool sleeping experience. A high-quality support layer provides the strong base for this mattress. 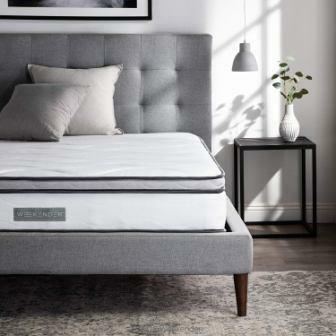 The T&N Adaptive Foam was engineered based solely on feedback from customers, and with the company’s co-founders taking into consideration the things they disliked in other mattresses. The result is a product that offers superior support & comfort in a mattress. 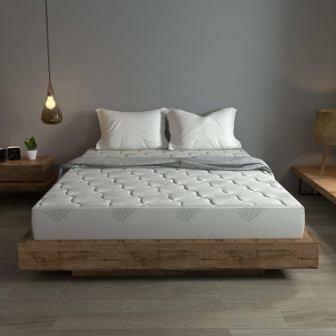 The mattress is crafted from the single proprietary material, without the need to combine two or more materials to come up with a decent quality mattress. This product has only 2 layers, compared to mattresses from other brands that have as much as 10 layers that may contain questionable materials. The polyblend cover is designed to withstand tearing and pilling, while its breathable properties ensure that you stay cool throughout the night for a relaxing sleep. T&N Adaptive Foam is created to adjust to your body weight and pressure. It is ideal for sleepers of any weight or size. This 10-inch mattress is ideal for use on all foundations, including an adjustable bed base. The proprietary T&N Adaptive Foam provides a bouncier profile compared to other foam products and promotes a cool sensation with the help of graphite and cooling gel infusions. The flexibility of this mattress makes it an ideal product for use with an adjustable bed frame. 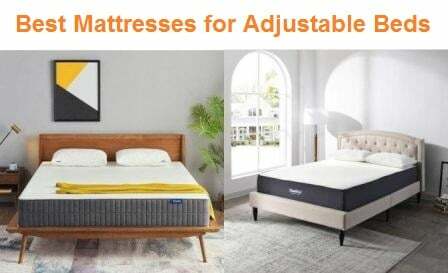 It is ideal for side, back, and stomach sleepers who will enjoy the mattress’ softness without feeling like they are being sunk or swallowed whole. This mattress is CertiPUR-US-certified, Greenguard Gold-certified, and OEKO-Tex-certified. 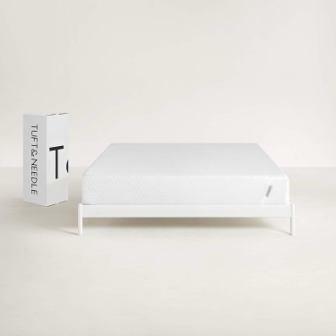 The Tuft & Needle Twin Mattress, Bed in a Box has a 10-year warranty and offers a 100-night sleep trial. On top of this mattress lies the 1.5-inch memory foam layer with a ventilated design. The 2-inch transition layer is composed of comfort foam infused with green tea extract. The support layer is made of 6.5 inches of high-density foam that will not sag even after years of use. The open cell memory foam layer comfortably conforms to your body, enhancing the softness as you lie down but without the feeling that you are being swallowed by the mattress. The open cell structure encourages free airflow so you will stay cool even after sleeping for several hours. The comfort foam infused with green tea extract fights bacteria & odor, so your mattress stays fresh for a longer period of time. This mattress reduces motion transfer, so you can rest assured your movements will not disturb the restful sleep of anyone sharing the same mattress. This 10-inch thick memory foam mattress is suitable for use on any type of bed, including an adjustable bed base. This is a medium-firm mattress which is ideal for all sleeping positions. 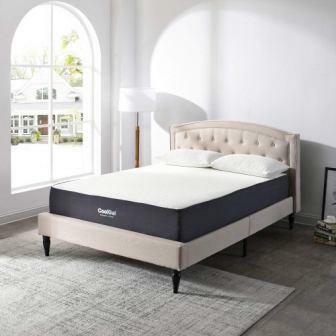 The top memory foam layer works to enhance your comfort by relieving pressure points, so you can finally find the most comfortable position to get the perfect night’s sleep. The transition layer of a green tea extract-infused comfort foam ensures that your spine is kept properly aligned as you sleep, so you do not wake up with aches & pains in the morning. This flexible mattress is suitable for use with an adjustable bed frame. 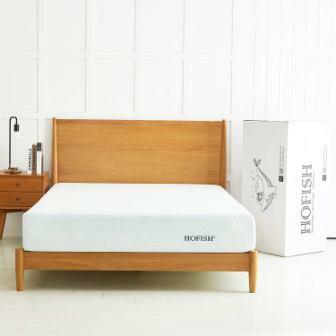 The HOFISH 10 Inch Medium Firm Gel-Infused Memory Foam Mattress is CertiPUR-US-certified. The support foam layer is guaranteed to be sag-free, and you can be sure that you will enjoy this mattress without sagging for years to come. This memory hybrid mattress consists of 2 layers – a base with individually-encased coils, and a comfortable memory foam layer. The contouring memory foam layer is composed of three layers: gel memory foam, comfort foam, and convoluted foam. A two-tone polyester fabric cover provides durable protection for the entire mattress. The individually-encased coils provide a firm base for the whole mattress – and for your body as well. They also greatly reduce motion transfer; this means that any movement you make will be concentrated on your side of the mattress and will not disturb your partner on the other side. The 3 layers of contouring memory foam (gel memory foam, convoluted foam, and comfort foam) all work to conform to your curves so you can sleep as you are comfortably cushioned by the mattress. This mattress offers firm edge support courtesy of the individually-encased coils. This support makes it possible for you to enjoy the entirety of the mattress in any sleeping position, without the fear of suddenly sliding off the edge. This mattress is 10 inches thick and is suitable for use with an adjustable bed base. The WEEKENDER 10 Inch Memory Foam Hybrid Mattress has a medium-firm feel, which makes it ideal for any sleeping position. The contouring memory foam layers maintain the proper alignment of your spine as you sleep, ensuring that you will wake up refreshed and without the aches & pains that come from an incorrect spine position. Pressure points are relieved with this mattress, making it easier for you to finally find the perfect position to get the most comfortable sleep possible. This product combines the support from the layers of coils, with the softness of a memory foam mattress. The WEEKENDER 10 Inch Memory Foam Hybrid Mattress offers a 10-year warranty. 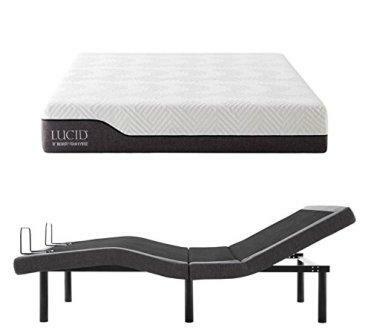 The top layer of the LUCID 12 Inch California King Latex Hybrid Mattress is composed of a blend made with 3.5- inch real latex and gel-infused memory foam. The supporting layer is made of 2 inches of dual transition layers that help reduce motion transfer. Acting as the support base are the 6.5-inch individually-wrapped steel coils that also help with the airflow. The memory foam easily conforms to the curves and contours of your body, so you will feel comfortably-cushioned as you lie down on this hybrid latex mattress. The latex composition, on the other hand, offers that welcome bounce and support that enables you to feel weightless – as if you are resting on a bed made with clouds. This mattress is covered with a breathable material that provides a breezy layer between the mattress and your body. This soft cover enhances your comfort every time you sleep, or even when you are simply sitting on the mattress. Keep your cool with the gel memory foam, which works by turning the heat away from your body. This foam layer also relieves pressure points so you will only have the most comfortable sleep regardless of the position you choose. The transition foam adds crucial support between the firm base and the comfort foam layer, so you will not feel like you are sinking into the bed. Motion transfer is decreased with the help of the foam-encased coils. You can be sure that your partner on the other side of the mattress will not be disturbed by your movements during the night. The 12-inch thickness of this mattress is ideal for use with an adjustable bed base. This is a medium-firm mattress, which is ideal for all sleeping positions. Enjoy the soft cushioning of the memory foam with the support and bounce of latex with this premium hybrid mattress. These characteristics also make this mattress suitable for use with an adjustable bed base. A 5-inch edge support feature makes it possible for you to enjoy the whole mattress without thinking that you will slide off the unsupported edges. The LUCID 12 Inch California King Latex Hybrid Mattress offers a 10-year warranty. This mattress is topped with a layer of Aloe Vera gel to enhance the cooling effect. The memory foam infused keeps the heat away from your body for a comfortable slumber. The middle layer is made of remarkably soft foam for unmatched comfort. A high-density foam layer makes up the supportive foundation of this smooth top mattress. The Aloe Vera-infused memory foam is designed with your ultimate comfort in mind. Aloe Vera gel is known for its cooling properties, which is evident in the way this mattress’ top layer maintains the cool temperature by driving the heat away from your body. Avoiding that overheated feeling will help give you a deep, completely restful sleep. High-density foam offers superb strength and support as the base layer, which also ensures that you get to enjoy the firmness of a hybrid mattress. 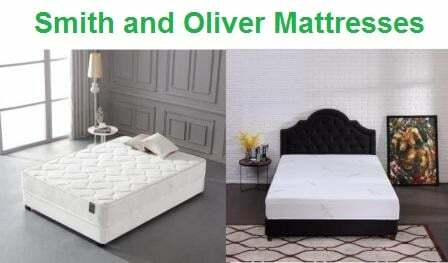 This 11-inch thick smooth top mattress is suitable for use on an adjustable bed base. Feel the remarkable softness of the middle layer, with foam that lovingly conforms to the contours of your body. This layer will give you the sensation of sleeping on a bed of the softest clouds for a truly refreshing slumber. This mattress is equipped with handles, making it easier for you to place the product in your desired position on the adjustable bed base. The handles will also be helpful when it is time for you to rotate the mattress to maximize its use. This mattress offers a 10-year warranty, as well as a 100-night trial. The top layer of this mattress is made of 2 inches of hollow conjugated fiber combined with poly jacquard fabric. An inch of cooling gel is added on top of the 1.5 inches of memory foam, followed by 2 inches of a high-density foam layer. 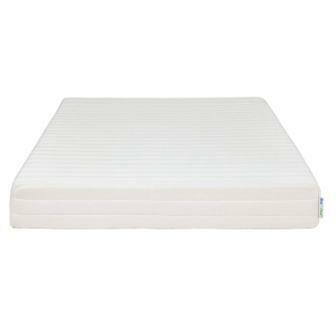 A 7.5-inch layer of individually pocketed coils provides a strong base for this memory foam and pocket spring mattress. 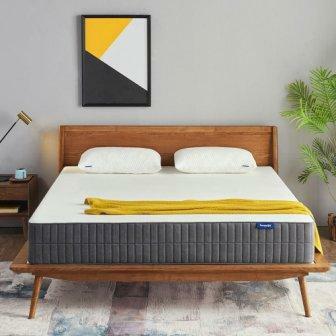 The independently-encased coils with a continuous coil design provide stability and support for the mattress so it can fully support your body as you take that well-deserved rest. This supportive base is enhanced with the pocketed coils that help the mattress to conform to the contours of your body, keeping your spine aligned properly as you sleep soundly for hours. The pocketed coils are covered with multiple high density and memory foam layers to ensure that you will have the ultimate in comfort and relaxation, and to enhance the durability of the mattress for years to come. This hybrid memory foam and pocket spring mattress is 13 inches thick and is suitable for use with an adjustable bed base. This mattress will keep you cool with an infusion of cooling gel, which works by driving the heat away from your body. You will not have to worry about waking up sweating and feeling extremely uncomfortable because of hot spots on the mattress. The supportive layer of heat-treated steel coils ensures that pressure points are efficiently relieved, so you will not be disturbed or woken up with pain on your hips, back, shoulders, and neck areas. The spring base layer protects your spine and keeps it in a properly aligned position as you sleep and recharge your body. This mattress is CertiPUR-US-certified and OEKO-Tex-certified. The Perfect Top layer is created to support the body and maintain the mattress shape. This top layer is followed by 1.5 inches of Dura Cool Gel foam, and underneath is the 1.5-inch Duraflex foam layer. The next layer is made is composed of 3.5 inches of convoluted high-density foam, which is then followed by another 3.5 inches of high-density foam for additional support. This mattress has a soft yet durable poly jacquard cover that can be removed and washed conveniently whenever necessary. The I Gel foam layer is infused with cooling gel which works by dissipating heat, ensuring that the temperature spikes stay away from your body so you can keep cool even after several hours on the mattress. The Duraflex foam layer offers elastic support, ensuring that the mattress goes back to its original shape and appearance even after years of use. The first layer of high-density foam provides support and acts as an egg carton layer, allowing air to circulate through the mattress for enhanced breathability. The supportive base is made of another high-density foam layer, which ensures that the mattress stays strong and durable even with the normal wear and tear from constant use. This 10-inch memory foam mattress is suitable for use with an adjustable bed base. 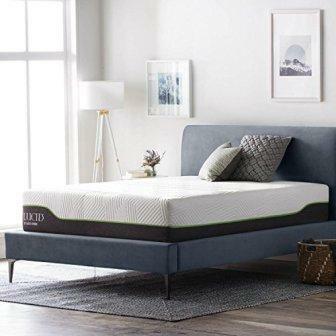 The materials used in making the Olee Sleep 10 in Aquarius Memory Foam Mattress are designed to relieve pressure points, so you will not feel pain on your neck, shoulders, hips, and back when you wake up from a deep sleep. This mattress is created to conform to your body’s contours, size, and weight. The gel infusion ensures that you do not get disturbed by hot spots on the mattress and that you sleep the night away feeling comfortably cool. This product is CertiPUR-US-certified and OEKO-Tex-certified.